Port-Of-Spain: The West Indies bowlers show brilliant performance to put a series level-ling victory against New Zealand after four days of the second test match on Thursday. The Black Caps, reached 257-8 continuing from their previous overnight total 73-1 in 2nd innings of the second test match at Queen’s Park Oval, leading by just 18 runs with two wickets in hand. Kane Williamson top scored with 52 while wicketkeeper Bj Watling shared an undefeated ninth-wicket stand of 43 with Mark Craig, 29 not out. The pair helped New Zealand to come out of trouble. 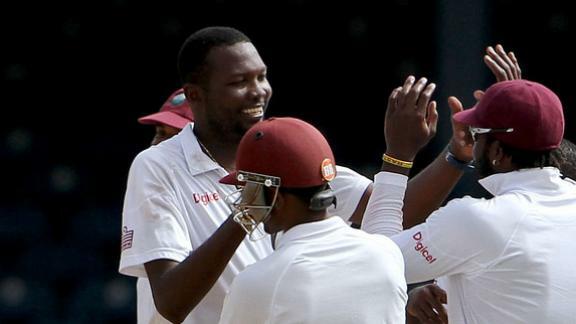 The West Indies grabbed wicket at regular intervals and put Kiwi’s batsman into trouble. The determined overnight partnership between Williamson and opener Tom Latham carried on for the first 45 minutes’ taking New Zealand to 84 before Benn struck. Latham gloved to silly point after a delivery from the left- armed reared off a good length. The left hander scored 36 off 138 balls and his stand of 75 runs with Williamson goes worth. Ross Taylor and Walting added 32.Taylor, who scoring 36 off 88 deliveries, was got out just before the lunch break by seamer Gabriel. Jerome Taylor gained reward for his accurate swing bowling by giving breakthroughs to hi team at regular intervals. He took 2-46, while fellow seamer Kemar Roach claim 3-53.left-arm spinner Sulieman Benn grabbed 2-62 in his 49 overs and also claimed a sensational return catch. He also gave his team earlier breakthrough of Jimmy Neesham’s in morning session just before the break. Neesham departed for 7 at 121-4. But the hosts could not quite complete the job as Walting and Craig held out for almost two hours to the close of the day 4 on Thursday at Queen’s Park Oval Port- Of- Spain. Craig survived one chance off Benn on 5, short leg Jeramine Blackwood putting down a chance to his right.